Heh, your tree looks like the vastly superior version of my tree. XD I'll probably change my color scheme down the line now that the cheaper ornaments are being given away in the free shop. I'm not sure we need a separate thread for tree stuff, though I guess it also depends on how many people want to talk about Luminaire Trees. Last week I noticed I had a day missing. AFAIK I got an SQL error when I collected on the 16th (?) and so it didn't count towards my achievement. I sent a ticket out about it because I did get at least one of the items that day and they fixed my achievement count, so it might be worth sending out your own tickets to see what's up. I finally loaded up my tree with all the shiny turquoise/blue, red, silver, and occasional gold ornaments i liked that i could possibly justify buying and fit on the tree. I flaked between the blue and multicolored light sets. The two stacked produce a blue-with-faint-multicolor-glow effect, so i went with that. AND i had some help thanks to some generous friends who gave me some of the ornaments i had on my wishlist! So thank you!! Merry Christmas and/or and-of-year holiday of your choice to everyone! Thank you so much to everyone who gave me such wonderful presents! As always, logging in this morning was overwhelming, and I'm not quite sure what to say...! Instead, have a picture of my tree, because apparently it's broken on my profile (so says Bon), which is a shame because I like it. 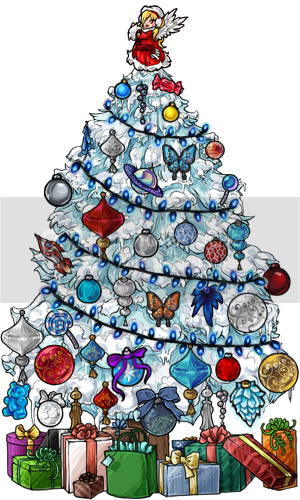 I wound up picking the Shadowglen tree, because I thought it went well with the silver ornaments, and they were my favorite. Thank you so much, my gift-giving friends! I haven't been able to be around much and I was so happy to see the sweet, wonderful gifts from people. I have tabs still open to make me smile. You guys are absolutely the best, and I don't deserve friends so nice. I want to also thank the gift givers, you spoil me so! I plan to thank everyone separately but I wanted to do a be thank you here! I can't wait to go through everything. I've just been so busy lately that I haven't been on as much as I like. I hope with the holidays finishing I can get some good time online to do what I want and such. I've enjoyed decorating the tree even though I haven't been able to do it just the way I want it. The prizes have been nice and pretty so far for advent. And I'm loving the new colour, such a cool idea. I like your tree, too, Ierosbats! Thanks to everyone who gave me presents, including one person I couldn't thank indivdually because he/she was anonymous! (And my abject apologies if I managed to miss someone sending out thank-yous!) It was so much fun getting the virtual gifts after I opened the physical ones. Now that I have more ornaments, this is fun! I wish you could just click on any ornament and drag it around the tree, instead of having to select them in the sidebar first, though. And I'm still hoping for more tree-toppers, and some garland and bows.